"Women should have their own major league and minor leagues plus the sponsors to make it go." Jochum wore this uniform, which was designed to provide mobility on the field without compromising the athletes' feminine appearance. According to the players' manual, A Guide for All American Girls: How to Look Better, Feel Better, Be More Popular : "The smart looking teams invariably play smart ball and you can add to your own drawing power and crowd appeal by looking the part of a ball player on the field. Keep your shoes clean and shining. And see if you don't feel better and play better ball." Betsy Jochum starred as an outfielder and pitcher for the South Bend (Indiana) Blue Sox in the All-American Girls Professional Baseball League from 1943 to 1948. Launched in 1943 by the owner of the Chicago Cubs, the league kept fans in the bleachers during World War II. 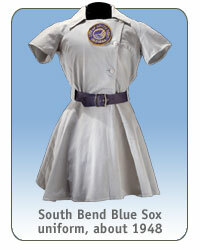 AAGPBL peaked in 1948 with 10 franchises and 600 players but was gone by 1954. "Sock'em Jochum" was one of the League's best hitters and runners, clinching the 1944 batting championship with an average of .296. She embodied the hopes of many women athletes who believed that the league was the breakthrough women's sports needed. Despite the league's short lifespan, its players pushed the envelope of social perceptions and advanced the cause of women's rights. Still, many professional sports remain closed to women. Jochum earned a degree in physical education and taught for 26 years. Whole New Ball Game: The Story of the All-American Girls Professional Baseball League.